Ray Stewart, family and friends in the winner's circle at the Downs. September 6, 2015. The end is near! Okay, perhaps that's a little too melodramatic, but this is my final blog story as the season draws to a close on Sunday, September 9. Wow, it seems like we just got started. Is it me or do the meets just go by faster every year? Consider for a moment the history of Manitoba horse racing as a bank account. For the past 100 years or so racing patrons' deposits have accumulated in the form of memories. Over the years, the balance in the special memory account grew exponentially with no end in sight. The sky was the limit! Enter among several other factors, the government's foray into the gambling business. For years horse racing was the only show in town in terms of legalized gambling. Now the sport has plenty of company in its fight for not just the gambling dollar, but the entertainment dollar too. Presto and abracadabra, before you knew it racing was in for the fight of its life. Withdrawals from the memory account began about 40 years ago or so and the balance in the account has dwindled to dangerously low levels. We've seen way too many racetracks close and those that remain are having a tough time of it. "I haven't been out to the track in years. I forgot how much fun it is and how much I've missed it." Smart Figure. Rags to riches 1998 Gold Cup winner. Tim Gardiner in the saddle. The Downs features 50 race dates in its thoroughbred horse racing season and this is only a small portion of its calendar for a facility that is open 365 days a year. For the Downs and its thoroughbred racing business to succeed, other ventures are necessary and must contribute in a huge way. We're talking concerts, night markets, trade fairs, weddings, socials and the like. Got a social event planned? Consider the Downs. If you're looking for something to do on a cold winter's night, take a look and see what the Downs has on tap. There’re almost always events going on at the track. Ever tried one of the Thursday Night All-You-Can-Eat Prime Rib Buffets? Well, "Do the Downs!" The Terrace Dining Room has the best view all year round, while you enjoy an evening to remember. Old memories fade, but we can make new ones together. Let's make a pact. I'll write about the memories of days gone by and keep them alive, while together we create new ones. There is no better example of this than Plentiful's miracle Manitoba Derby win in 2017 for the Duncan and Stewart Racing Stable. In 2016 partner Garylle Stewart passed on Derby Day and the Stable didn't win a race that season. One year later the Stable was back on track winning stake races, culminating in its first ever win in the Manitoba Derby. Talk about turning your fortunes around! To close out the 2018 season, let's take a look back at some final-day-of-the-meet stories from years gone by. Day 80: Manitoba-bred Smart Figure won the Gold Cup, edging out the popular Smoky Cinder. Trainer Gary Danelson had bought the down-on-his-luck gelding privately for next to nothing. 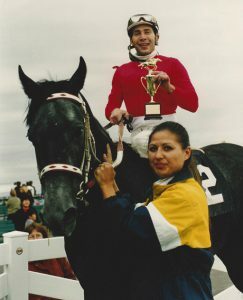 The Gold Cup was his seventh win in eight starts for Danelson that year. 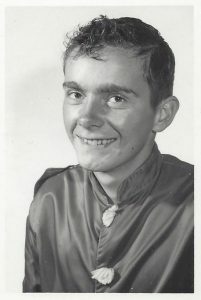 Mike Rowland won five races on the final day of the ASD meeting in 1983. Day 109: Jockey Mike Rowland notched himself a five-bagger (What a Blaze, Equal Status, Hasty Royal, Angle's Intent and A Rogue's Game) on the final day of the live meeting, bringing his total for the year to 114 wins, good enough to earn him the 1983 riding title. Day 129: Job's Alibi won the sixth race for the People's Stable and tied the record for the most wins in a single season at eight. The record had been set in 1977 by Flag the Trayne and equaled by Liz's Pride and Speedy Frost in 1978. Day 56: Anna Stables' Mr. Bizbee won the final race of the meet. In the 60-year history of Assiniboia Downs no horse has ever won the first race on opening day more than once. And no horse ever won the first race on opening day and the final race of the meet. But one horse did win the final race of the meet – twice! Mr. Bizbee accomplished that feat by winning the last race of the season in 1973 and 1975. He was owned by the late Louis and Anna Selyem. On both occasions Bizbee was ridden by their son, Joseph! Frank Barroby set a new single-season win record for jockeys at the Downs in 1963. Day 42: Jockey Frank Barroby hit the Winner's Circle four times (Vanwin, Frisky Bop, Lady Fly and Mis-Deeds) on the last day of racing in 1963. The quad gave him 78 wins for the year, the Downs jockey title for 1963, and a new single-season record for wins by a jockey at the Downs. The previous mark of 59 had been set by Winnipeg's own Tommy Stadnyk in 1961. Day 42: I. H. Halverson's Dr. Pat won the first running of the Gold Cup. The form chart shows that he was ridden by R. Stewart, but not Robert (Bobby) Stewart. The rider that day was Gladstone's Raymond Stewart, who was on hand to make the Gold Cup trophy presentation in 2015 at the age of 93. Mr. Stewart passed last January, but those present for the 2015 Gold Cup trophy presentation ceremony will long remember how friends and family members crowded into the winner's circle (see photo at the top of this post) to help Mr. Stewart remember his Gold Cup win back in 1958. Starting next week, The Insider Newsletter will feature "The Best of Bob" where you can catch-up on some “oldies but goodies” stories from previous years. They'll keep you entertained until live racing returns for the 2019 season next May. Until then, see you next spring, and thanks for reading! L to R 1958 Gold Cup-winning jockey Ray Stewart with Downs CEO Darren Dunn and Track Historian Bob Gates in the winner's circle for the Gold Cup on September 6, 2015.